Solid promises from God's Word spoken prophetically over your life to encourage and lift you above the storms of life. Stand firm in His unshakable Kingdom, remain unshakable above the storms and live in the embrace of His unfailing love. 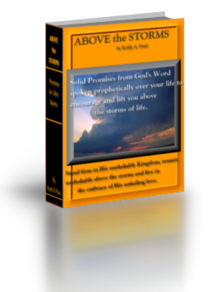 This E Book positions and equips you for victory over life's troubled seasons. Note: You will be emailed Your E Book Download Link immediately after your payment is verified. Thank You. Be sure you provide your correct email address. Thank you. There are 45 days of inspirational opportunities before you to encounter His supernatural Presence. As you make your way through this E Book, I encourage you to receive what God is declaring over you each day. The number 4 represents four seasons or four directions such as E.W. N. S. The number 5 represents God's grace. Therefore, the number 45 is prophetically declaring God's grace over all your seasons and over what ever direction you turn your face.